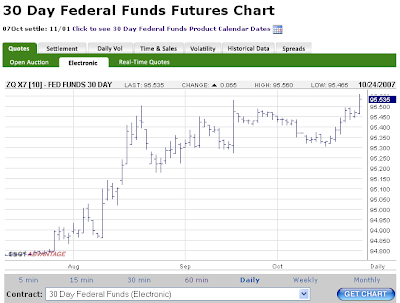 Fed Funds have priced in more than a 25bp cut for next weeks FOMC decision. Strategies? Short front month, long back month. Expecting the next week of trading to be low volume and to get choppier until FOMC day. Closing positions- Should've closed these yesterday when they were making money, but was too busy at work. I'll do better on my new positions. Long 1-3month BIL until Oct 30th. Short Eurodollar, long ZB , seeing if this is a good hedged/spread trade. How much premium is based into index futures. For example if you go Long DIA & short YM, does this equal a hedged trade where you collect premium on futures contract and recieve dividend payouts on DIA. I'm looking at the new BIL; ETF, and ways I can make money using it to outperform my savings account. If I use 2x leverage in my brokerage account, will this outperform my savings account interest rate of 5.25%? What are the risks, and what are the tax advantages/disadvantages? What interest will I pay my broker from the overnight loan, and is this a wise choice? Should I collect the interest payout each month, or should I attempt to trade this ETF between the payouts and look for arbitrage opportunities between this ETF and the underlying bills? How will the commissions costs contribute to my overall profit/loss for this trade? Would an IRA account be best for this type of trading? Will I still receive interest from my broker if I use my margin account and take a position overnight?